Thank you for helping with another hardworking and dedicated year of service. 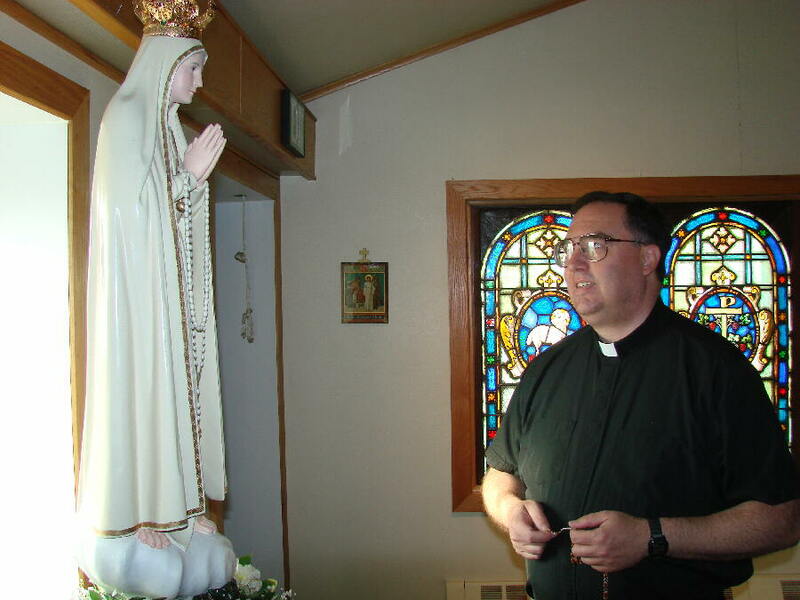 Throughout 2009, you have provided our listeners the Rosary, and for many, the only opportunity to worship with the Mass. You have given them encouragement and positive companionship 24 hours a day. You have brought them international, national, regional and local news. You have allowed them to join live discussions on issues that concern them. You have helped honor and preserve their ancient cultures. You have helped in the broadcast of 34,000 educational spots and 34,000 inspirational spots. Your gifts of finance and prayer have kept this vital radio mission alive, beaming throughout 100,000 square miles of the most remote, road-less parts of Alaska. Our words of thanks to you pale to the depth of our gratitude, as together, we make the KNOM radio mission possible. Thank you, thank you, for giving the gift of KNOM to thousands during 2009! CUSTOMARY (left): In September, the King Island Singers and Dancers perform in the village of Wales, in the heart of KNOM listening country. KNOM’s Leah Radde, who took this photo, records the performance. 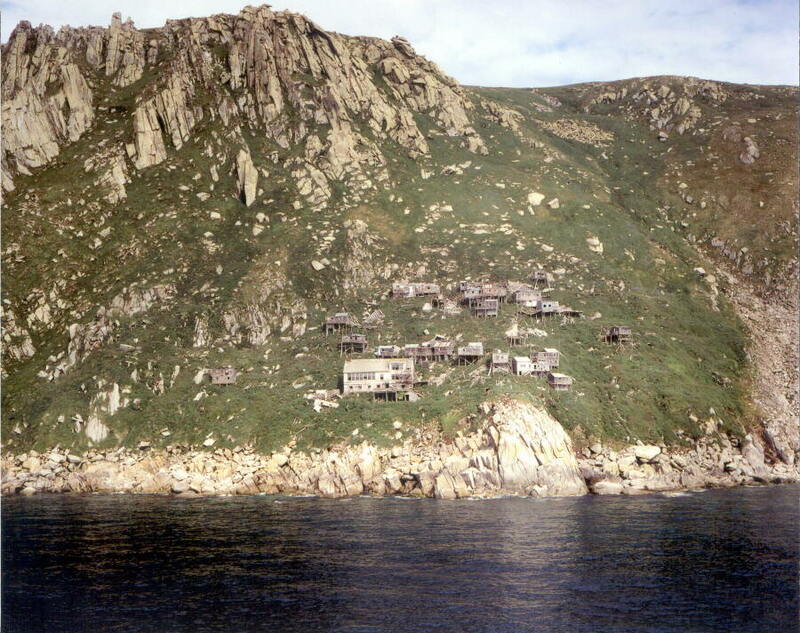 King Island (left) is a steep, rocky point some 40 miles west of the Alaska coast. An early 1970s KNOM tape recording of the ancient King Island Wolf Dance helped revive the work in 1991, after much of it had been forgotten. ANNUAL FINANCIAL REPORT: In the fiscal year ending June 30, KNOM was given $1,404,116 and spent $1,320,941. Although we technically had a net income, it came with sadness, as we only met our bills due to a handful of large bequests. Without this income from wills we would have suffered a shortfall, though we lost some very dear and treasured friends whose legacy is that they helped us survive what would otherwise have been a difficult time. 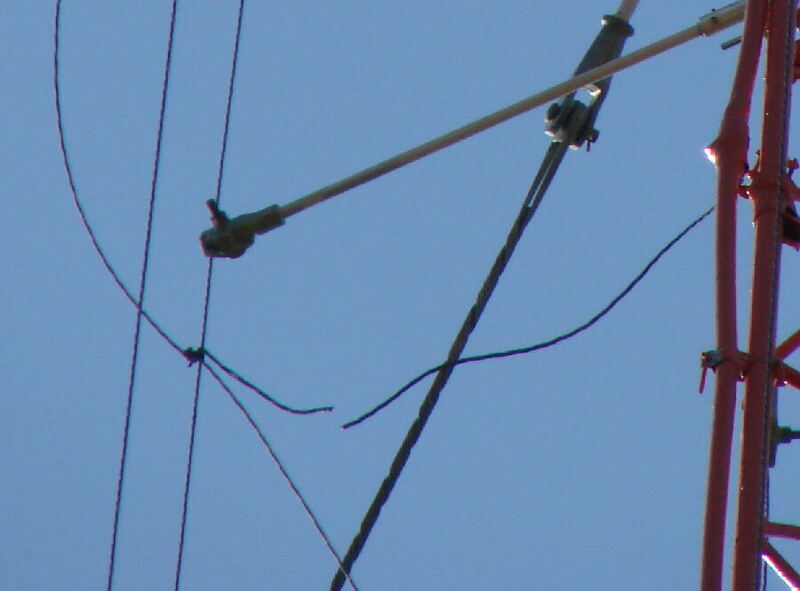 Replacement of some failed 15-year-old equipment and emergency tower repair in the ensuing months consumed most of the remainder. 2.5% of our income was from interest, the value of donated air fares by local airlines, program underwriting (sponsorship of programs in return for brief announcements), grants, and rental of tower space to the National Weather Service. 97.5% of our income was private gifts by good people like you. If you would like a copy of our mission’s detailed financial statement, please write business manager Lynette Schmidt, or e-mail her at knombusiness@gmail.com, and she will be happy to send it to you. Again, thank you for supporting us, whether by prayer or by a financial helping hand. E-THANKS: Please also contact Lynette if you prefer receiving thank you notes by e-mail. ROLL OVER: If you are 70-1/2 or older, you can rollover up to $100,000 from a traditional IRA to a qualified charity, like the KNOM radio mission, tax-free. Originally established by Congress in 2005, the rollover capability has been extended until December 31, 2009, so time is short. Ordinarily, withdrawals from an IRA are taxable. For a charitable rollover, however, the entire amount goes to the charity, with no tax levied. If you are in a position to make a major gift, this may be an excellent time to ask your financial advisor about an IRA charitable rollover. WE RESPECT YOUR PRIVACY, and, as we have, since our mission’s inception, we pledge that we will never provide your name and address to anyone, for any reason. Is KNOM really the oldest Catholic station in the United States? Yes. We signed on July 14, 1971, almost fifteen years before the second oldest, WBVM in Tampa. Do you really have listeners in Russia? There’s no taking a survey, but yes, many Russians who have visited Nome tell us they’ve been listeners for years. Walking the streets of Provideniya, USSR in 1989, then-general manager Tom Busch discovered that his voice was familiar there. Why does it cost so much to operate KNOM? According to the most recent report by the University of Alaska, the cost of food in Nome is 218% what it is in Portland, Oregon. Heating oil is 190%. Do you really pray for contributors at every weekly staff meeting? You bet we do. Thank you! In mid-month, the control panel on the transmitter site’s emergency generator indicates that it has run 677.9 hours since the unit was installed in 1998. That’s 28 days of power outages! The Nome Static thanks friends who contributed toward its purchase and installation . 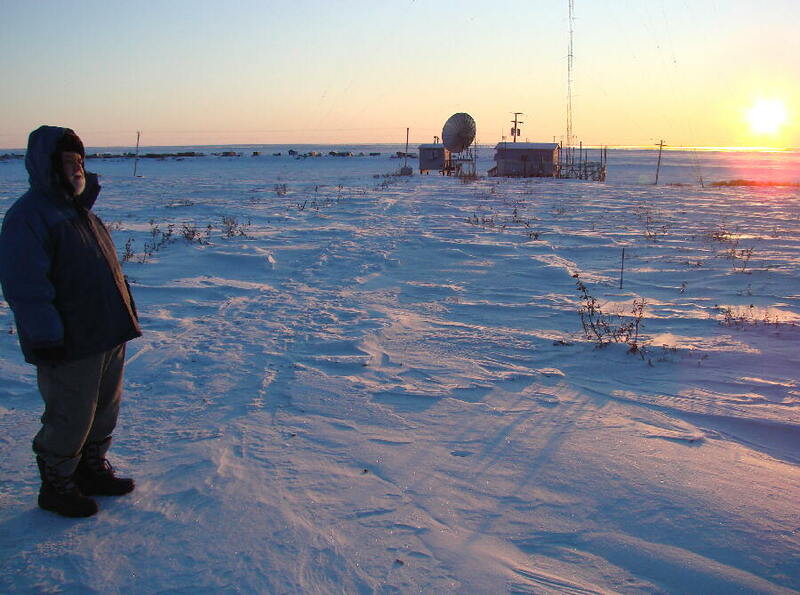 (Left) In January twenty-below weather, Les Brown walks to the KNOM transmitter site. At high noon, the sun only peeks a few degrees above the horizon. On a volunteer basis, Les flies to Nome several times each year to help with engineering duties. February-March: It’s 22 days to be remembered, during which a string of 13 consecutive brutal blizzards hammer Nome and the region. Several days, except for police and KNOM, everything just about shuts down. The region affected is the size of Maine to Alabama, and west as far as Chicago. 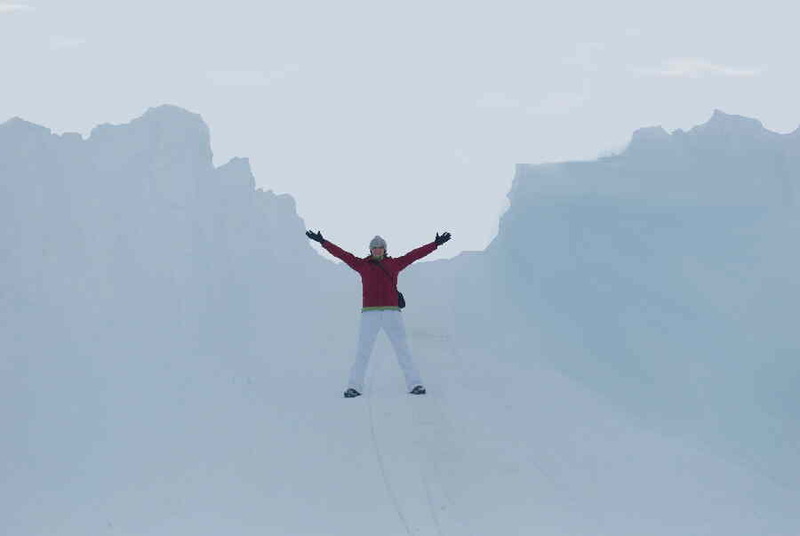 (Left) Some of Nome’s plowed streets have sheer walls of snow ten feet high, as KNOM volunteer Danielle Sylvester demonstrates. (Left) Program director Kelly Brabec checks out a drift a half-block from the studio. KNOM is off the air briefly, and receives calls from many villages. Most ask “where are you?” as though trying to locate a missing friend or family member. 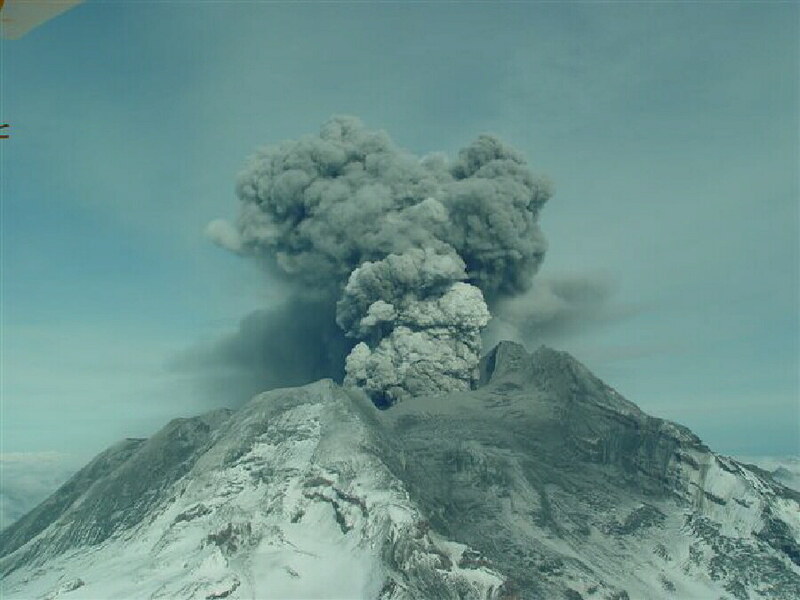 March 22: Seismologists have been watching the volcano for months, and today, Mount Redoubt (left) erupts violently, throwing corrosive ash as high as twelve miles into the atmosphere. Alaskan air travel virtually stops, cutting off western Alaska from the outside world. A flight that leaves Nome is unable to return to Anchorage and winds up stranded at Barrow, on the north coast of Alaska, until the ash settles. Ten other flights are canceled. In the first week, scientists note eleven major eruptions. April: (Left) Public affairs director Laureli Kinneen (at left) and Danielle Sylvester interview NASA astronaut Bill Readdy, who has flown three Space Shuttle missions. Readdy speaks enthusiastically to KNOM listeners about the country’s space program. This month, KNOM is also broadcasting extensive river flood watches and warnings, as the Yukon and Kuskokwim Rivers and smaller streams form ice jams which back up melt water. Also this month, KNOM general manager Ric Schmidt happens to meet a man who says that in her village, his mother’s health is failing, and she relies on KNOM to stay connected with people, as he and other friends and relatives send her little messages over the air. 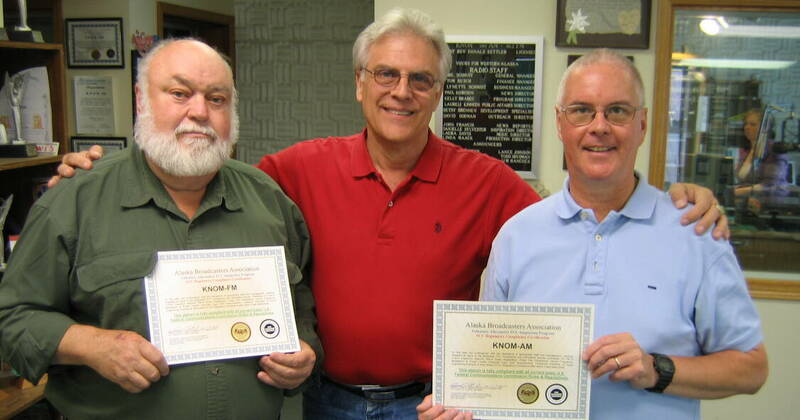 And…volunteer Dave Dodman (left) begins making “tweets,” announcing upcoming programs, on www.twitter.com/knom. 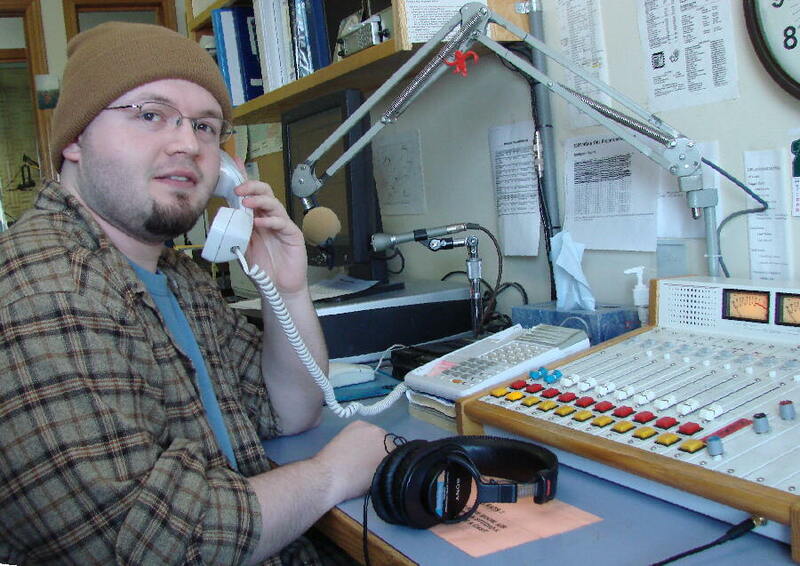 June: For KNOM volunteer John Francis (left, in the KNOM Radio Mission newsroom), his reporter’s beat takes him 634 miles south to the town of Kodiak, covering a conference to discuss ways to help rural Alaskans who suffer from substance abuse, or have been sexually molested. “The number of people who have been molested is staggering,” John says. This month, KNOM financial officer Tom Busch is elected co-chair of the Alaska Public Broadcasting Commission. July 1, Father Ross Tozzi (left) returns to Nome as pastor of St. Joseph Parish and celebrates Mass less than an hour after arriving. Fr. 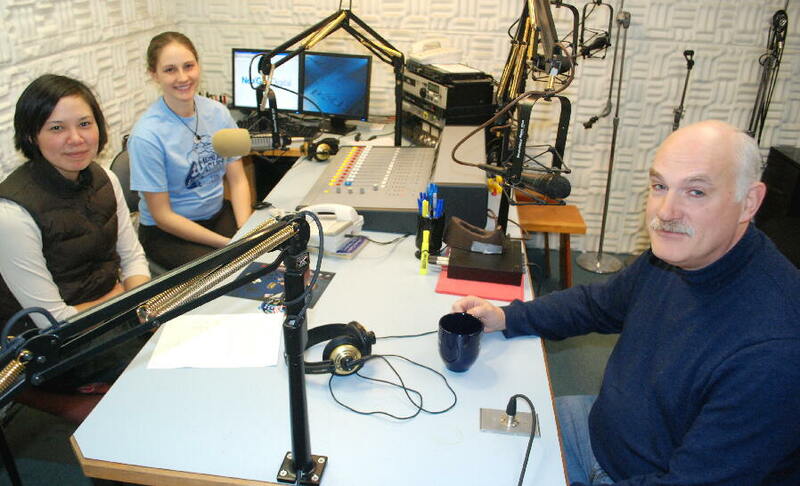 Ross was a KNOM volunteer from 1989 to 1991, and was ordained in Nome, live on the air, on KNOM’s 30th anniversary. 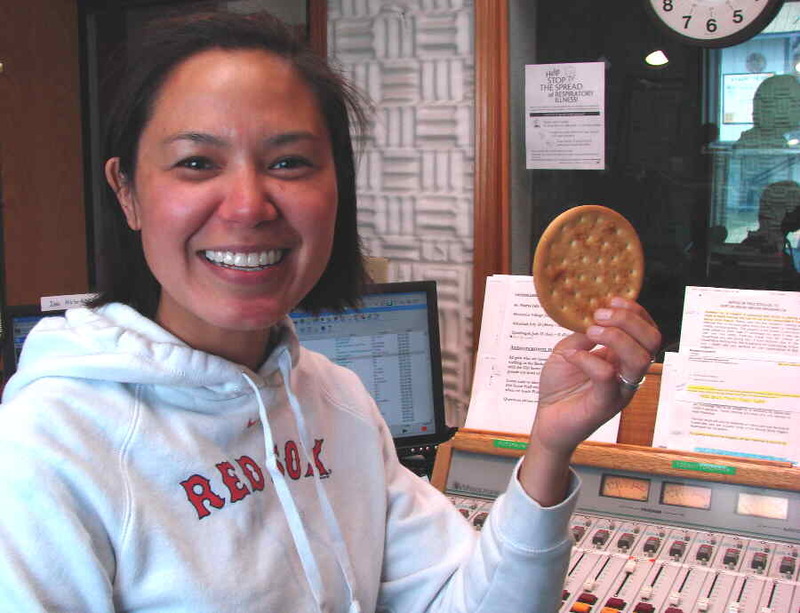 This month, the Nome Static reports that Laureli Kinneen has produced an overwhelmingly popular call-in program on the topic of recipes for using Sailor Boy Pilot Bread, a staple hard tack cracker for western Alaskans. Dozens of KNOM contributors write to learn more about this practically indestructible foodstuff, 98% of which is consumed by Alaskans. This morning, at very low power, KNOM reports Nome’s first frost since May 31. September: KNOM volunteer Leah Radde covers an Inupiat (in-OO-pee-at, northern Eskimo) dance festival in the remote village of Wales (left), and fellow volunteer Linda Maack does the same thing in the village of Teller. 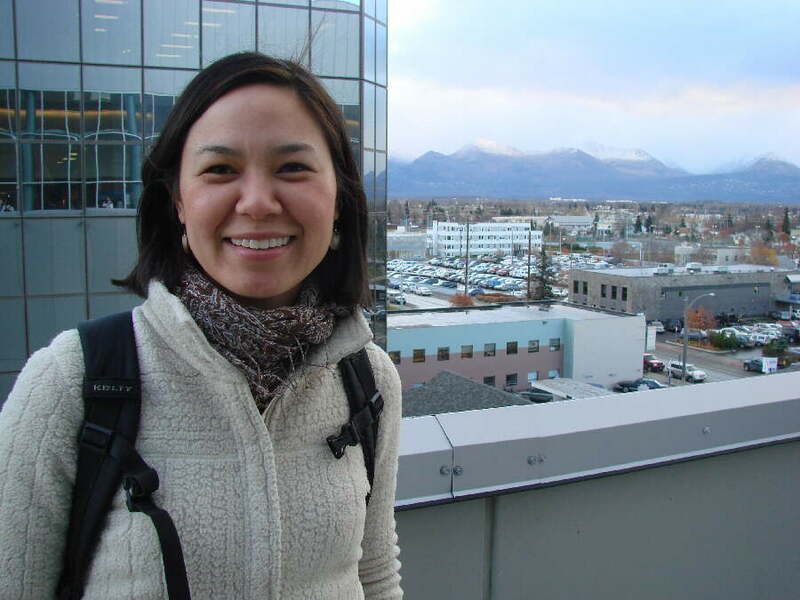 They file reports by phone, and the traditional Alaska Native music they record adds to KNOM’s collection. 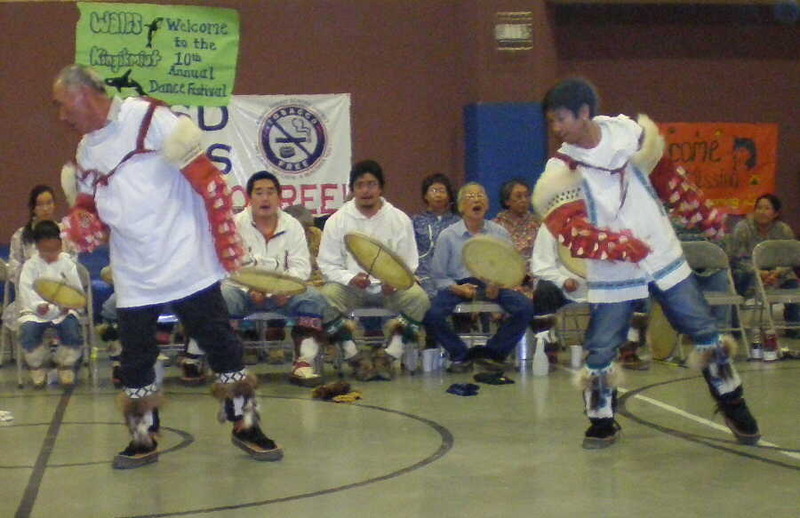 For more than thirty years, KNOM has played one Eskimo or Athabascan Indian song an hour. 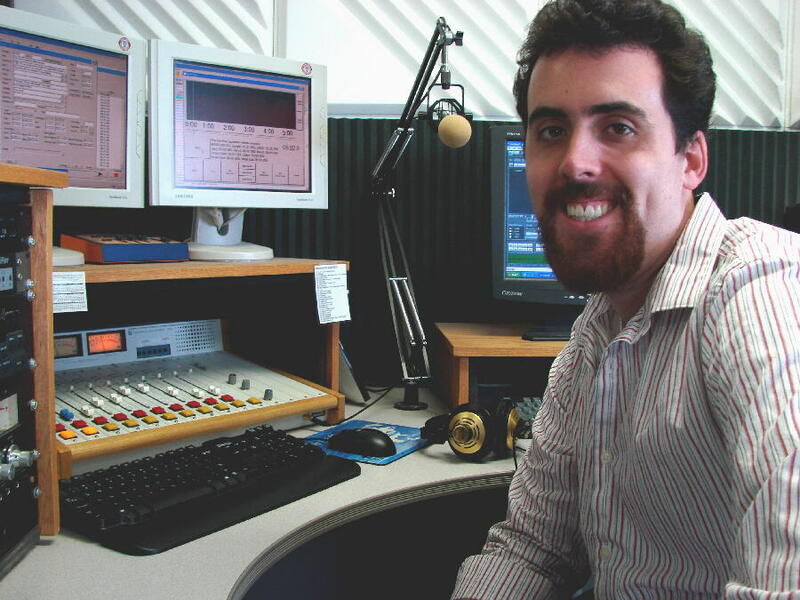 October: KNOM receives the 2009 Gabriel Religious Radio Station of the Year, for among other qualities, “dedication to excellence.” It is KNOM’s 17 top annual Gabriel. 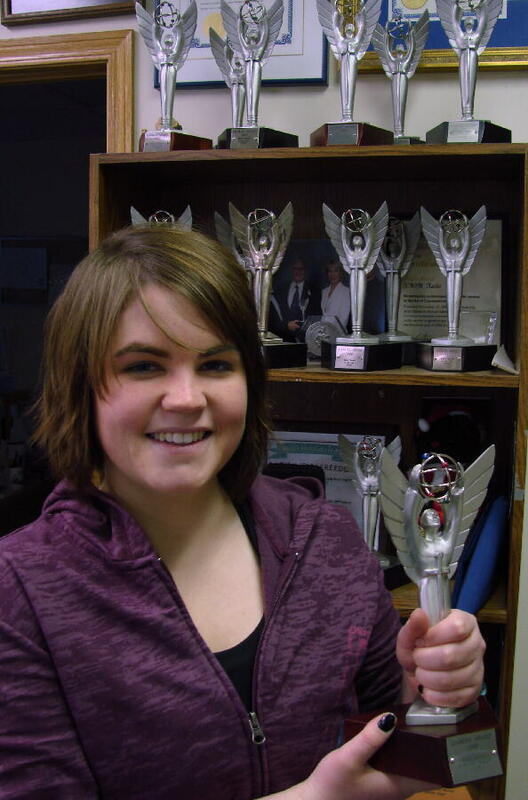 (Left) Leah Radde holds the latest honor. Linda Maack is back in the air, this time to the village of Savoonga, covering a first-ever village workshop by the group ASSIST (Applied Suicide Intervention Skills Training), which forms and trains a support group of teenagers. KNOM’s hope is that the publicity which the station provides will encourage other villages to follow. Also this month, KNOM public affairs director Laureli Kinneen (left) is in the big city of Anchorage, providing live reports and interviews from the annual Alaska Federation of Natives convention. 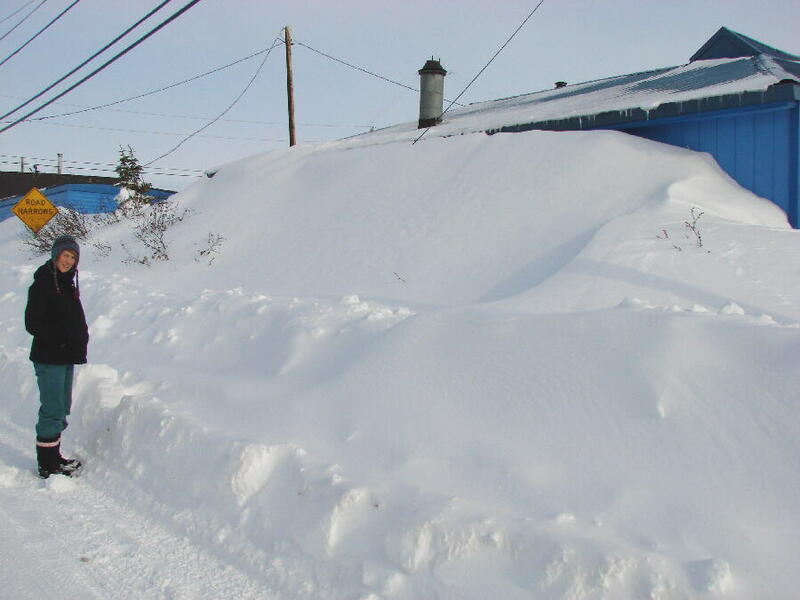 November 8: KNOM broadcasts the winter’s first storm warnings, as western Alaska is pelted by heavy snow and powerful winds. November 11th brings the season’s first multi-day blizzard. We close with a prayer. As we embark upon the year 2010, we pray that for you and those you love, it is blessed with every good thing, and an abundance of God’s blessings. Thank you so much for your kindness. May you enjoy a blessed and happy New Year! INSPIRATIONAL SPOT: To know the will of God is the greatest knowledge. To do the will of God is the greatest achievement. Blessed are those who ask "what can I share?" not "what can I spare?" Copyright © 2009 KNOM. All rights reserved.